There was apparently a Part I of this. There was also a report on a trip to the same general location three years earlier. But I digress. I hadn’t been back to Meißen since ’93, so that’s something. It’s a cool, old-looking city. We toured the Dom and went to the porcelain factory store (because the tour gets poor reviews). Walked around. Saw old buildings. Went to a bakery, although I wasn’t sure if that was meant as lunch or a light snack. I got kicked out of the factory store because I was wearing a backpack even though everyone else in the store was also wearing a backpack and was not getting kicked out. I dunno. Left me a little Meißen-negative. I’d say Rothenburg did it better, but Rothenburg is kind of fake while I think Meißen is mostly original. Quedlinburg does it better. Next time I’m over there I should probably head back to the East Harz and re-verify. There are probably some good hikes around that area also. I misstated myself: this was the first time back in Meißen since ’02 when I visited with the Nooduitgang, none of whom follow my blog. The train rides to Meißen and back were fine. Somehow it felt like we’d been doing a lot of things, so we kind of took a day off to do less things. 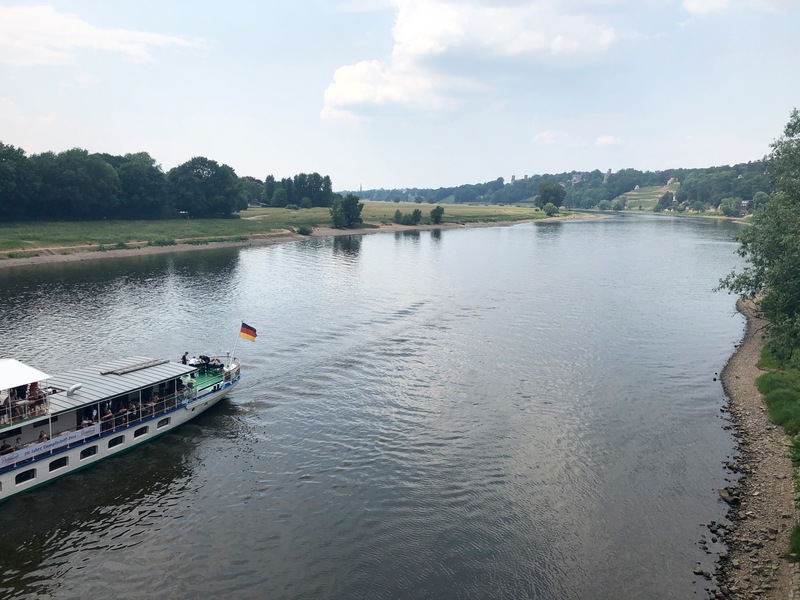 The major highlight, though, was taking the Straßenbahn out to Blasewitz first for lunch at a legit German restaurant, then to take a look at the Blaues Wunder bridge, which is I think mostly noted for not having been blown up in World War II like all the other bridges were. Blasewitz is a neighborhood of Dresden that’s reasonably central — I think there’s maybe one other neighborhood between it and the central Altstadt (possibly two). But yet the photo above is the view down-river heading toward the Altstadt. Point being: even inside city limits, Dresden can look pretty pastoral. Blasewitz is also one of the wealthier parts of town. A lot of villas and large homes there. It was my second choice for neighborhoods to stay in. I guess I’ll mention our accommodations now. 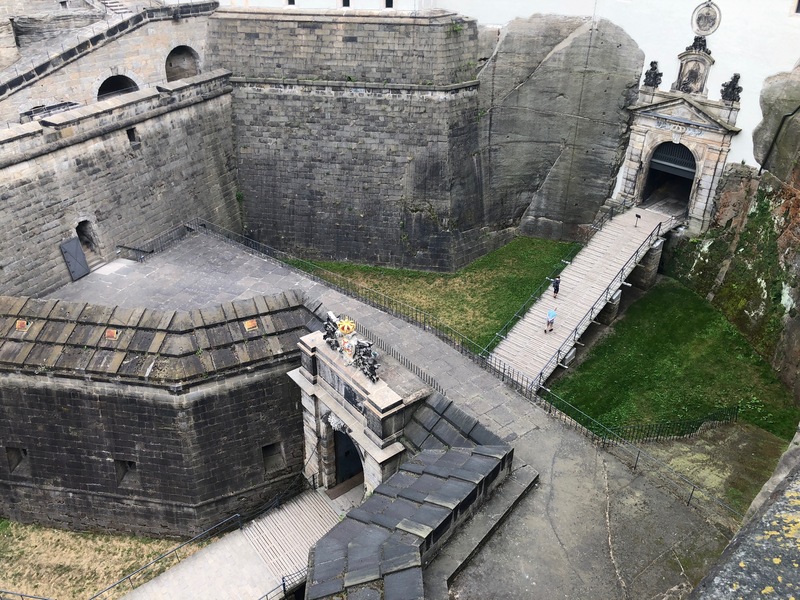 I found a place off AirBnB that was, like, the only two-bedroom, one-point-five bath vacation rental available in all of Dresden. 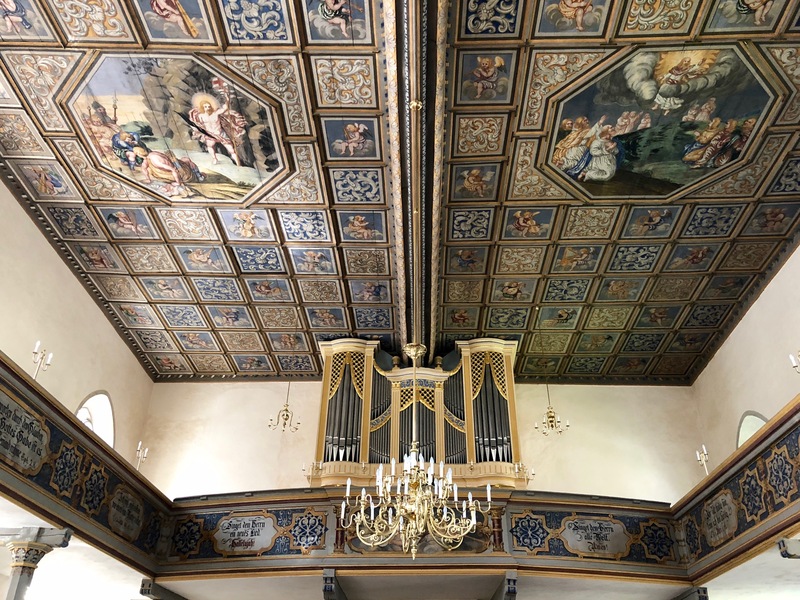 It was well located in Innere Neustadt. OTOH it was a super hot week for May in Dresden, the place had no AC, and there was no way to get a cross-breeze going with the way the apartment was laid out. Therefore: it was hot and hard to sleep every night. Should have gone to Blasewitz, enjoyed the fresh breezes off the river. Is that a thing? One day I’ll live closer to a river. I live a block and a half away from a river right now, but I can do better. Having Garry and Judie along for this trip was great in most possible ways. Made the vacation a lot more enjoyable, not least due to being able to see this place through someone else’s eyes. 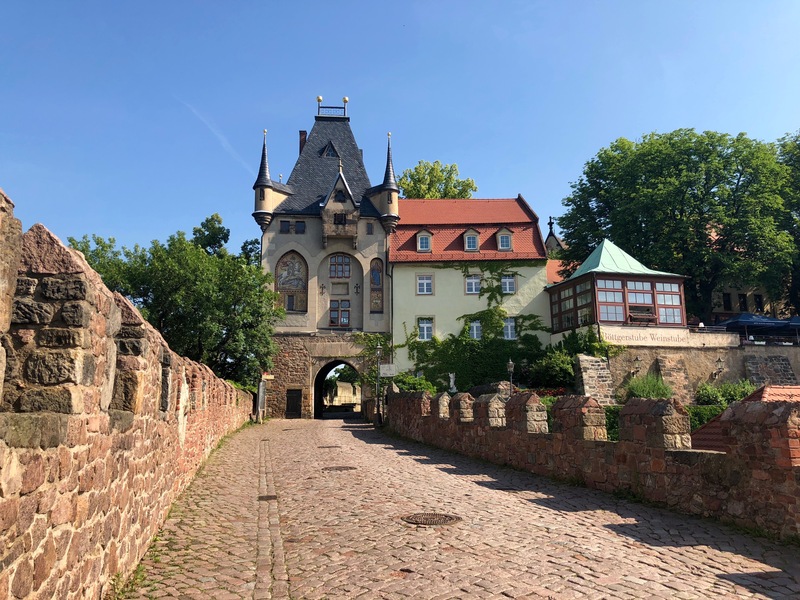 Having Garry there in particular, who always only ever has visited the Romantic Road parts of Germany when in-country, made me realize that if there is such a thing as homogeneous Germany, then the southeast corner of Saxony isn’t part of it. 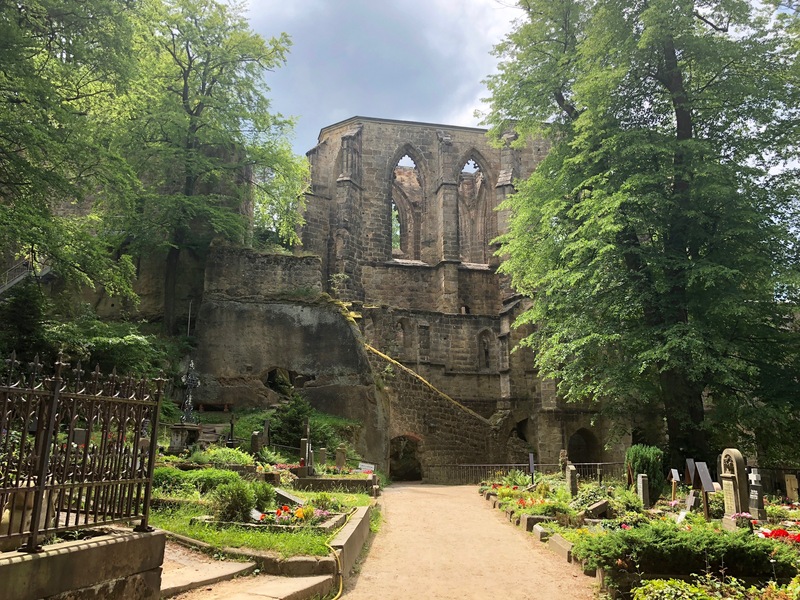 Or also, having on my previous trip to the country visited Bad Urach for Thomas and Kristine’s wedding — Dresden and its surrounding areas feel nothing like that place. It’s interesting to me how countries in Europe, despite language barriers, still seem to blend into one another. 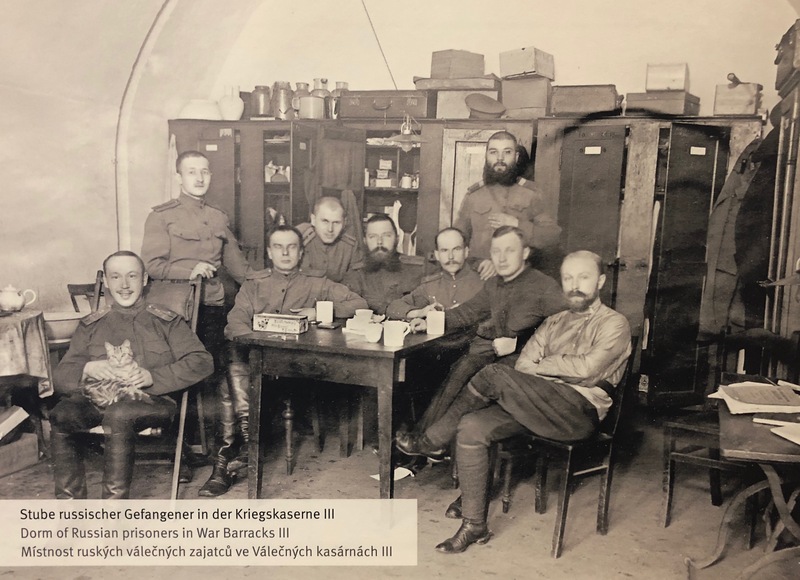 In this corner of Saxony, it’s easy to feel the pull of Poland and Czech. Things are a little slower, less sophisticated, less developed, and less modern. It’s like this: when I think of going to Germany, I’m always thinking of Germany as Dresden. The reality, though, is that Dresden isn’t, I don’t think, all that German. Western Germany seems kind of homogenized — a lot of it looks and feels like the States. Dresden (and for that matter most of the east) never feels like it’s part of that homogeny. It’s like you’re visiting a whole other non-US country. At any rate, those were things that really hit me on the day we drove out to Oybin. 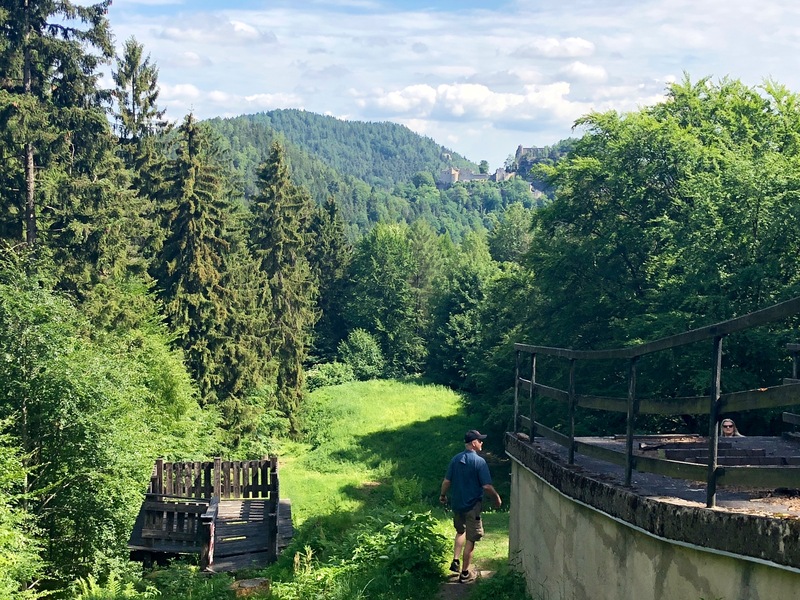 For one, it’s hard to imagine that somewhere in the Schwarzwald there’s a drive-through ski jump in some stage of decay from which you can look out over the valley to the hill where the ruined cloister is. Also, some of the elements of vor-der-Wende East Germany aren’t all that far away. And then Oybin has this whole ruined cloister (abbey?) that, while not unvisited, isn’t overrun by tourists like it would be if it were a mere hour out of Mannheim. And then we drove back to our Neustadt hot-box. This was actually Sunday. 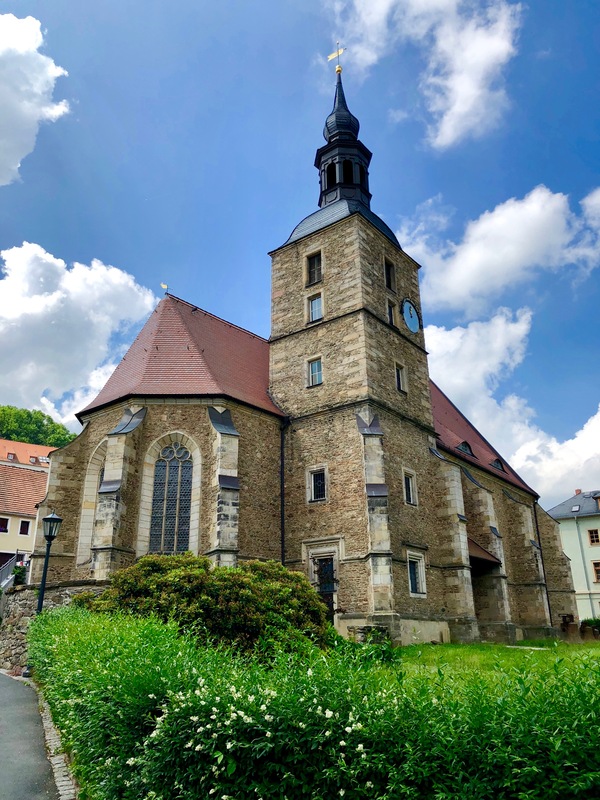 My brother and I drove out to Mittweida for church, where we were informed that it was stake conference and that, for some reason, everyone was meeting in Chemnitz. 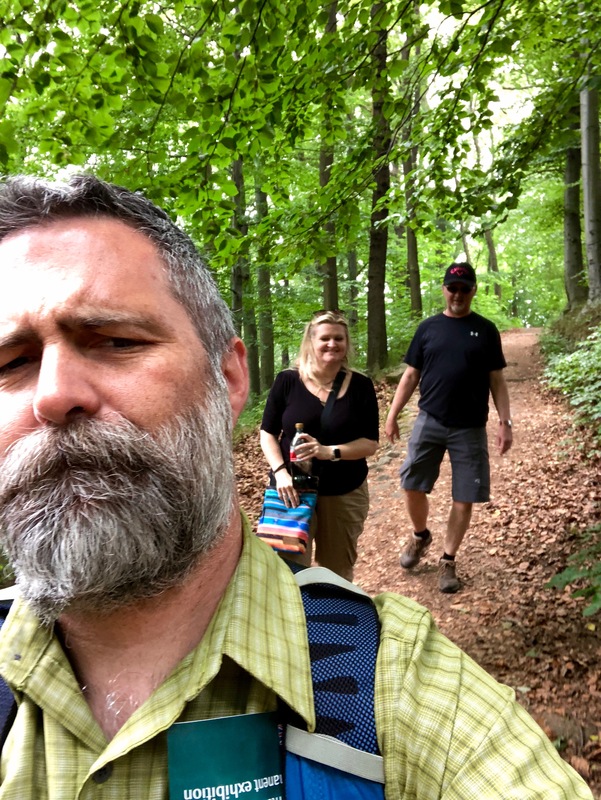 So we then drove out to Chemnitz only to find out that by “stake conference” they meant “regional conference broadcast from Salt Lake”, at which point we kind of noped out. 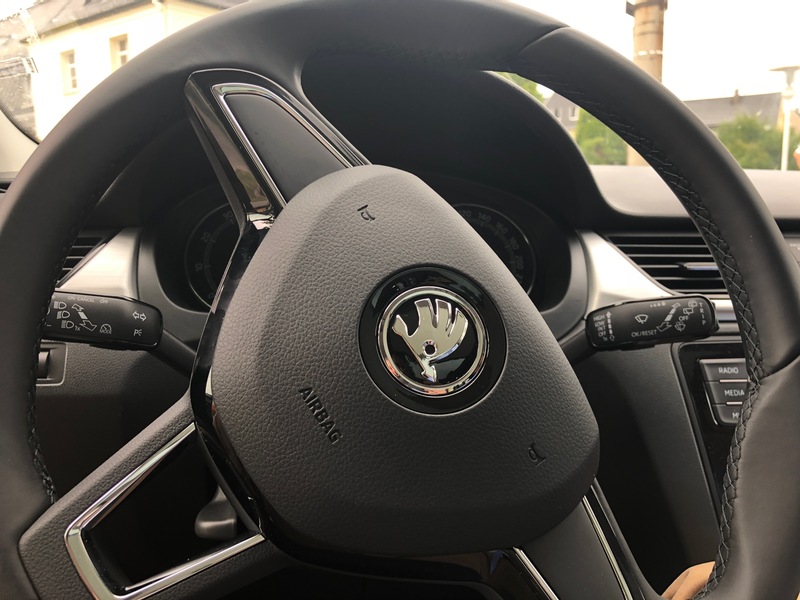 But hey, at least I got to drive around a lot in the rental Skoda! 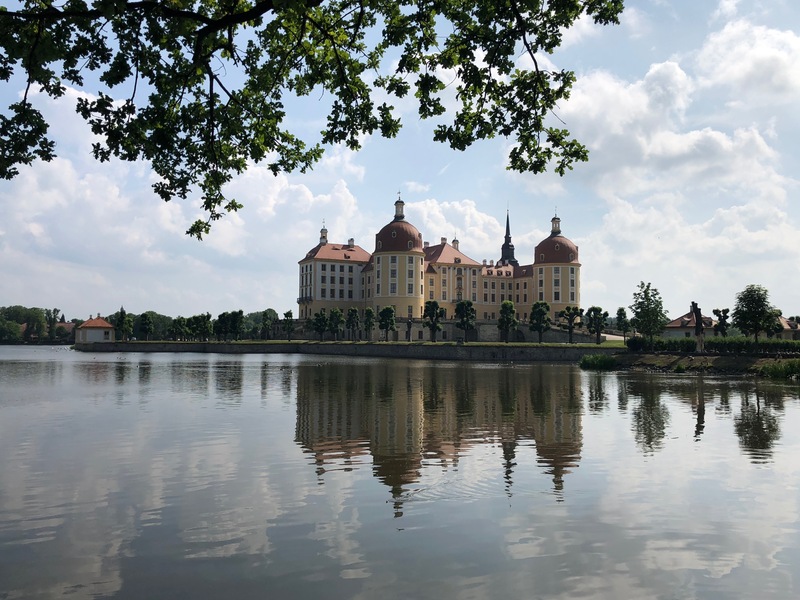 Then we went back to Dresden, probably ate or something, then headed out to Schloß Moritzburg to interact with more locals doing what locals do on a weekend. 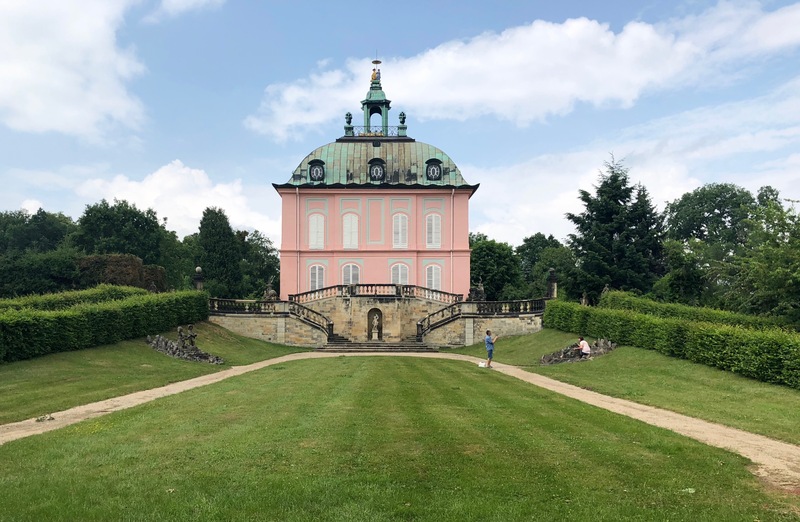 Next day we ended up going to the Erzgebirge, specifically Glashütte and Seiffen. 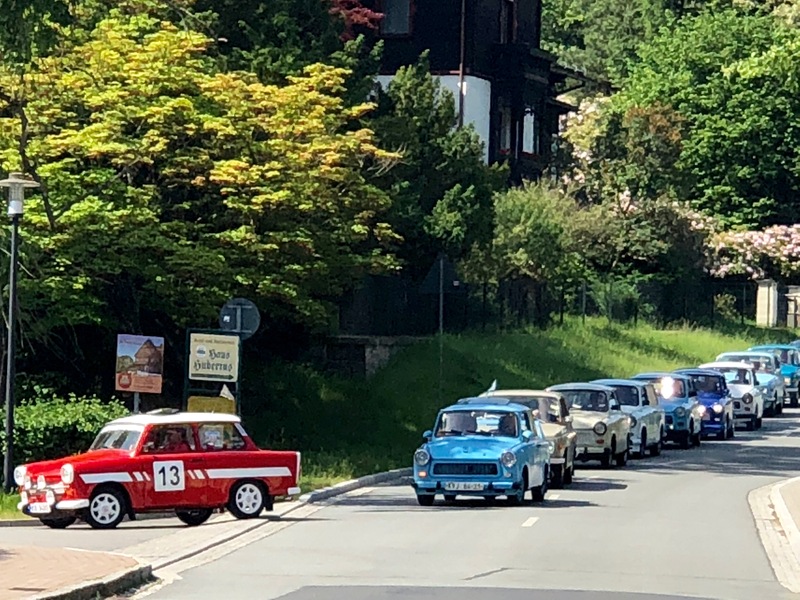 Glashütte is the city where the finest German-made watches are made (if you know your watch brands — well, A. Länge & Söhne and Glashütte Original are hand-made here). Seiffen is where wooden Christmas ornaments come from. So — yeah. Unfortunately, there’s not a lot of watch-making to be seen in Glashütte, at least not outside the pleasant museum at the center of town. OTOH, there’s a cool little church there that was fun to sit in and try to figure out what all the artwork was symbolizing. Of all the churches we saw on this trip, this was the one that I could most easily imagine attending. FWIW. Probably because of all the dark colors. And then Seiffen was Seiffen. I bought a couple ornaments, because what else was I gonna do? Garry and Judie bought something bigger, the identity of which has been lost to the ether forever. Or I guess I could ask them what it was. Somehow this was only an eight-day visit, yet it has 10 days in it. Lost to the ether. Festung Königstein is a fortress complex up in the Sächsische Schweiz. My co-travelers needed to end the day in Berlin and I in Kassel en route to the airport the following day or something. 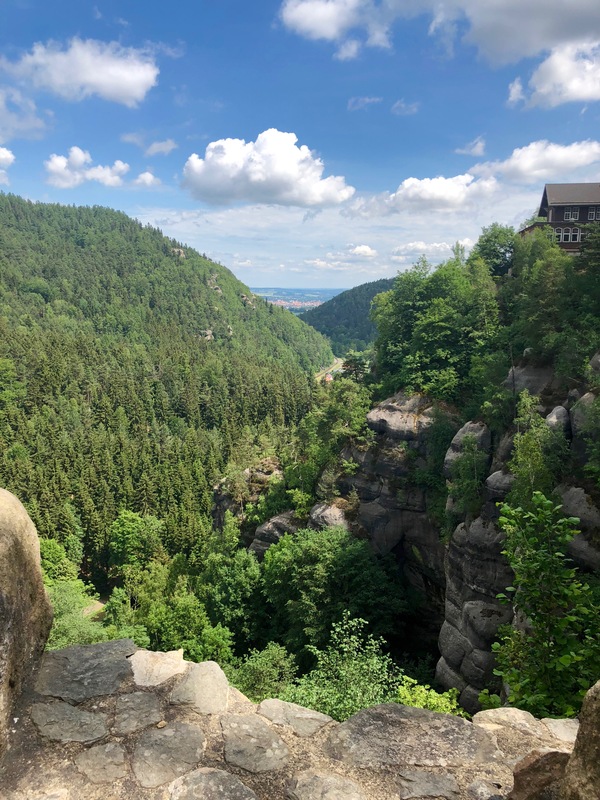 Hadn’t been to Königstein since ’93 though. Forgot what a good little Ausflug it was. 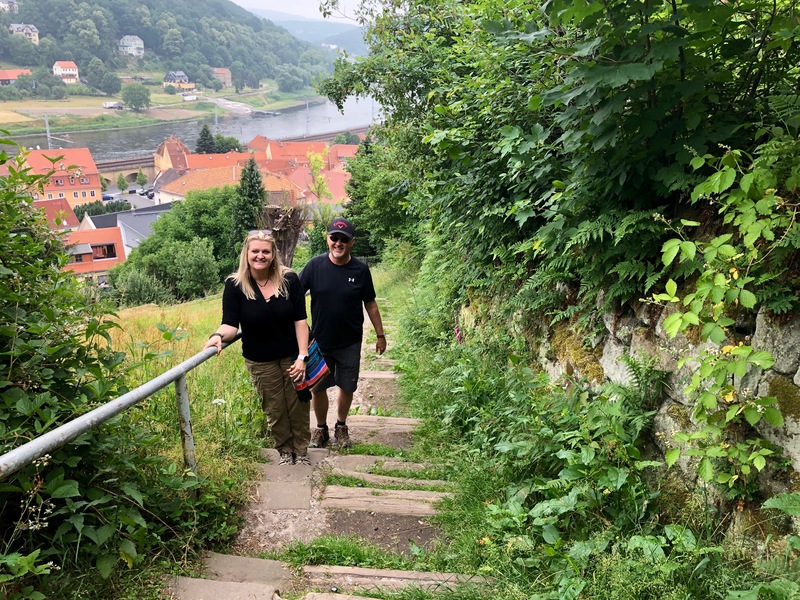 Took the S-Bahn out to Königstein town, then hiked up the hill so we could feel superior to those idiots who just drove to the top like, you know, idiots. 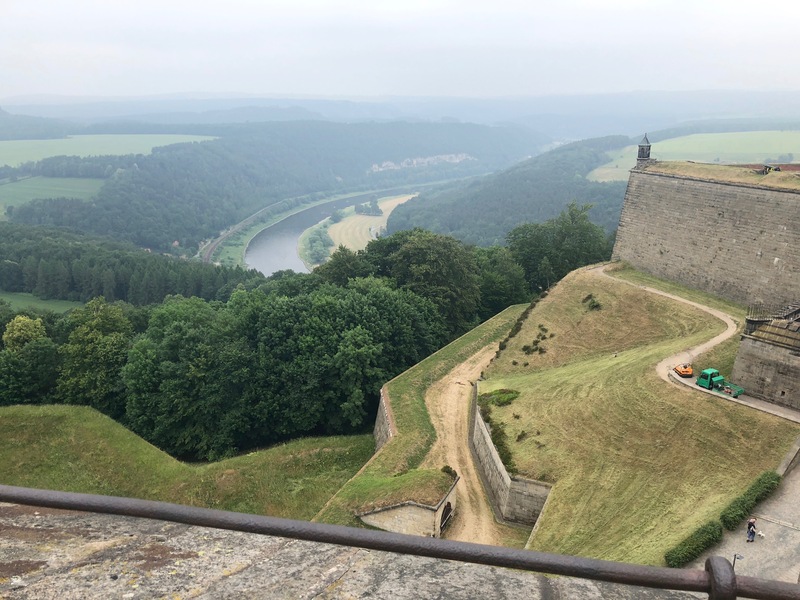 The fortress was used for a lot of different things over time and tells a pretty clear story of Saxony and its fall at the hands of first the Prussians then later Napolean. One of the things it was used for, though, was as a POW camp during WWI. The one prisoner really likes his cat. He also kind of looks like my nephew-in-law. For tourist site qua tourist site, this one was probably my favorite of the trip. Wish we’d gone there with more time on our hands and without concerns about returning a rental car and catching trains. I’d sort of hoped to hit this up as part of a bike ride down the Elbe, but that didn’t materialize this time around. Maybe next year. And then we went back to the apartment, packed up, then took the rental car back. Before taking the rental car back, though, my brother asked if I knew how to get to where we were going. I answered that I could walk there pretty easily, but that I was pretty sure that driving there would require us to make at least five concentric circles. I was pretty close to right-on with that estimate. Finally, my thanks to all of you who think of Dresden as, at best, a place to stop over for a night between Berlin and Prague. You’re so right. So, so right.